From Dunwich to Innsmouth, from the halls of Miskatonic University to the Charles Dexter Ward at Arkham Sanitarium, trouble is in the air. The stars are almost right, and terrors from beyond space and time are beginning to break through. When Cthulhu rises, we're all doomed – but whose downfall will be the most entertaining? 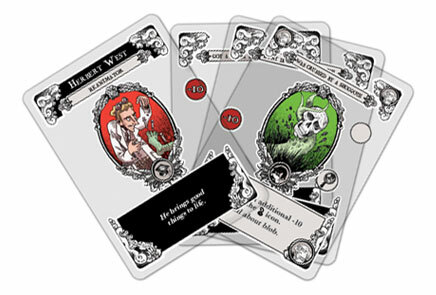 One or more Story cards can be placed face up on the table at the start of the game; the first player to meet the conditions of a card – drawing the attention of The King in Yellow or heeding The Call of Cthulhu, for example – can claim it and gain the benefits it lists. Game plays well, even with the same people however in order to keep it fresh it is better to play with a different group every time. It is slightly easier to talk a friend into playing a game about sad destruction then one might think. From the general gamer to the random friend plenty of people enjoy this game. I’m not sure if many grandmothers would enjoy this game however mine did, and asks to play when we visit. I love gloom and this version is even better, all the Lovecraft based families and events add a neat twist to an already great game. I have played this game with my family over and over and it never gets old. Being a huge Lovecraft fan I enjoy the theme immensely. The art is grotesque and lovely! Anyone who likes card games like Fluxx or Munchkin or if you want to try something new, I highly recommend this game. This is also a must have game for any Lovecraft/Cthulhu fan. They just released an expansion, which I look forward to obtaining. I consider this a gateway tabletop game for people who enjoy the topical Lovecraft, The Addams Family or any horror-inflected dark comedy. It certainly has a unique physical aspect and the twist of losing to win suits the quirky flavor. Some folks I’ve introduced the game to are actually a little put off by the morbid notion of killing characters, mostly their own, which makes it a party game for peculiar guests, I suppose. Add a Review for "Cthulhu Gloom"